Ask fellow campers about "Kitty Hawk RV Park" and nearby attractions. The man that checked us in was very helpful and friendly. The sites are extremely close together. There is hardly any room to sit outside of your site without sitting under your neighbor's slide. At least it was cold when we were there and didn't spend a lot of time outside anyway. The majority of the park looks like fulltime residents, with only a few campsites available for others. 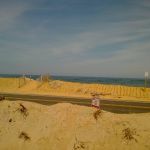 The location is great for visiting the Kitty Hawk area, I just wish they would give you some more room at the campsites. Verizon and AT&T worked well. We camped at Kitty Hawk RV Park in a Fifth Wheel. Staff really was over the top helpful with getting me set up an making sure we were taken care of. We actually extended our stay at a whim and he ensured we were good to go. We will be back. We camped at Kitty Hawk RV Park in a Fifth Wheel. Bring your leveling blocks because the sand is soft even though the sites are pretty level. I gave it a rating of 4 because of the lack of bathrooms and the postage sized sites, but we were right next to the beach! When I say postage sized sites, I mean our camper barely fit with the slides out. The neighbors parked their car in front of my picnic table because they didn't have room, so I had to partially block the next site over with my truck. The caretaker is extremely nice, (helps you back in the camper and makes sure you have everything you need). We were on site #3, and were literally 100 yds from the beach. Cross Rt12, and you're there. We went down for my friend's wedding in Duck, 8 miles North, and pretty much only slept at the camper. I had never been to the Outer Banks before and enjoyed the stay. If it weren't for the beach being so close, I would have not liked it. I do have to say that it is a very quiet and very clean campground. It was nice walking the beach on your way back to the camper to help digest. The surf was up, and playing in the waves is always fun. The beach is dog friendly, and they had a blast too... Just clean up after them, PLEASE. If all you want is a place to sleep, then this is the place to go! Lastly, bring Windex and extra paper towels... You will need them to clean the salt off your windows and mirrors when you leave. Yes, we were that close to the beach... We camped at Kitty Hawk RV Park in a Travel Trailer. Hurricane Mo's! It's within walking distance, and they have GREAT FOOD AND SERVICE. We sat at the bar and ate, as it would have been a 40 minute wait to get a table. Try the Cat 5 Hurricane while you're there. The Wright Brother's Museum is about 10 minutes away, and there are a lot of shops on Rt 158. Kill Devil Hills where the Wright Brothers made their powered flights is 10 minutes away. Nice to see, (being an aviation buff). Just because you are close to the water does not mean that you can over charge.....just to be at the beach. Was there for 3 nights for a family visit....Very small sites....small means that your canopy almost touches the rv next to you when open. I hated this place, but if you stay on the Soundside in the summer you get eat up with mosquitoes!!!!!!!!!!!!!! We camped at Kitty Hawk RV Park in a Fifth Wheel. Everything at the beach.....cause it's the Beach. Very, very tight, on soft unpacked sand, almost impossible to level our coach. Our stabilizer jacks and blocks sink into the soft sand. Bring a shovel to get level. Wi-Fi was almost non-existent. We camped at Kitty Hawk RV Park in a Motorhome. We stayed here 2 nights. The reason to stay at this place is the direct access to the beach you have. It is mostly filled with permanents, so it could feel very tight in season. There are no restrooms or showers. You must be self contained. The Wi-Fi was very weak, for cable you need to give a $100 refundable deposit for the box, ours never did work, even after notifying the manager. But even saying all that, if you are about the beach, this is the place for you. The pups are allowed on the beach and they had a great time. We think we will try the place down the street next time. We camped at Kitty Hawk RV Park in a Travel Trailer. Basic shopping and local restaurants are convenient. We ate Barefoot Bernie's which was pretty good. Good location to visit the horses and Kitty Hawk. This is a no-frills park, but you're essentially "on the beach." You're in the heart of things, close to all that's going on in the Outer Banks. The greeter and manager are very nice and offered to help with any issues. The cable and WiFi are good, but you need to put a $100 (check) refundable deposit on the digital box. We camped at Kitty Hawk RV Park in a Motorhome. Water, sewer, electric, and cable TV box ($100 deposit). We love it here. Sure the spots are tight, and there is no laundry, but we usually camp on the beach, so we are used to no frills. You stay here for the beach, period. Staff is friendly, and the park is clean. That's all we want. We camped at Kitty Hawk RV Park in a Travel Trailer. Not much more than a sandy parking lot, but excellent beach access and a good place to stay while visiting the area. Forget about using jacks here, but if you're not level just dig holes in the sand around the tires until you get it right. Site spacing was extremely tight, possibly the worst we've seen. We could not extend our awning without hitting the neighbor's coach. The 50-amp power and water were very strong, and each site had sewer and a table. The staff was friendly. Note that credit cards are not accepted here. As previously mentioned, there are no facilities so bring your own. They appear to offer Wi-Fi, but we brought our own and did not try it out. There was some noise from the road next to the beach, but it was somewhat offset by the nice sounds of pounding ocean waves. Grocery stores, the Wright monument and other services were minutes away. Fine for a few days, but probably not longer. If the sites were a little bit roomier we would rate it much higher, and it is a bit pricey considering there are no facilities. However, we would stay here again if in the area. We camped at Kitty Hawk RV Park in a Motorhome. This RV park has only one advantage - location. It is directly across NC Hwy 12 from the beach, with its own direct access. The park has about 60 permanent seasonal motor homes, as well as the 30 transient sites. We were able to hear the ocean waves as we went to sleep. There are NO facilities at this RV park. Each site has full hook-ups, cable and the Wi-Fi is steady. Other than that, it is a sandy parking lot. We camped at Kitty Hawk RV Park in a Motorhome. While this Park has an excellent location, the lack of restroom and bath house amenities is unacceptable, especially for the nightly rate of $55.00. Yes, the staff was very nice, and the park does provide Wifi and cable, but I am very am very disappointed that It was not made clear when I called about a reservation that there we no restrooms or bath house. It would have also been helpful if the park's web site could have pointed out all amenities they provide. Sorry, but I cannot recommend this location. I can give some advice, ask about all amenities before making a commitment! We camped at Kitty Hawk RV Park in a Motorhome. This RV park is a no frills (no bathhouse, no restroom, no pool) RV park, but I love it. For two years in a row, I was in a site that had me 69 walking steps from the beach. The owners are friendly and if there is a problem, they take care of it. We had a family come in and they had five little dogs. They put the dogs in a pen outside their RV, and they did nothing but bark and bark and bark. After a half-day of listening to that, I spoke with the owner and they took care of it. No more barking dogs outside the RV. The Wi-Fi was not reliable; however, I mentioned it to the owner and they stated they would talk with their provider. If you are looking to go to the beach, hang out and relax, this is perfect. We camped at Kitty Hawk RV Park in a Motorhome. Manager very friendly, ocean right across street. Sites are tight But good place to stay for convenience to wright brothers museum & wild horses. We camped at Kitty Hawk RV Park in a Motorhome. Hurricane Mo's! It's within walking distance, and they have GREAT FOOD AND SERVICE. We sat at the bar and ate, as it would have been a 40 minute wait to get a table. Try the Cat 5 Hurricane while you're there. The Wright Brother's Museum is about 10 minutes away, and there are a lot of shops on Rt 158. Kill Devil Hills where the Wright Brothers made their powered flights is 10 minutes away. Nice to see, (being an aviation buff). Are you affiliated with Kitty Hawk RV Park ?